Sampson has a home! 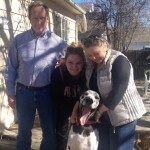 - Rocky Mountain Great Dane Rescue, Inc.
Sampson has a home with Pat & Betsy in Albuquerque, NM. They are no stranger to the breed, in fact they’ve had 3 danes over the last 30 years! Their last Dane named Lucie whom they adopted from RMGDRI 7 years ago, sadly passed away last year. Well, they are ready to fill that hole in their hearts and in their home with another Dane! Lucky Samson fit the bill! They were able to meet sweet Samson and fell in love at first sight. They love to take their Dane on hikes and tooling around town…Way to go Samson, you will be loved to the moon and back.